Before the Renaissance period, Italian painters took their cues from the East. Adhering to the Byzantine conception of religious art as fundamentally symbolic and atemporal, medieval Italian painters deviated from earthly realities as a means of signifying the supernatural and divine. 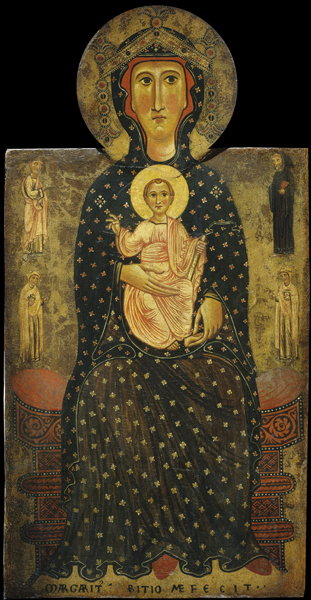 In devotional icons’ such as Madonna and Child Enthroned, c. 1270, by Margaritone d’Arezzo, the frontal presentation, linear emphasis, and geometric patterning cause the figures to appear incorporeal and immobile, suggesting a transcendent state of absolute permanence. The picture’s suspension of time, movement, and change provides a striking contrast to the constantly fluctuating conditions of humanity, offering a vicarious experience of heavenly peace to those who knelt before the image in prayerful contemplation. Static icons continued to inspire reverence and awe for the centuries that followed, but beginning in the late thirteenth century and reaching a high-water mark in the fifteenth, painters gravitated toward the sacred stories through which Christians understood their religion: the miraculous life and death of Jesus Christ; the extraordinary trials of the Virgin Mary; and the exemplary acts and martyrdoms of holy Saints. 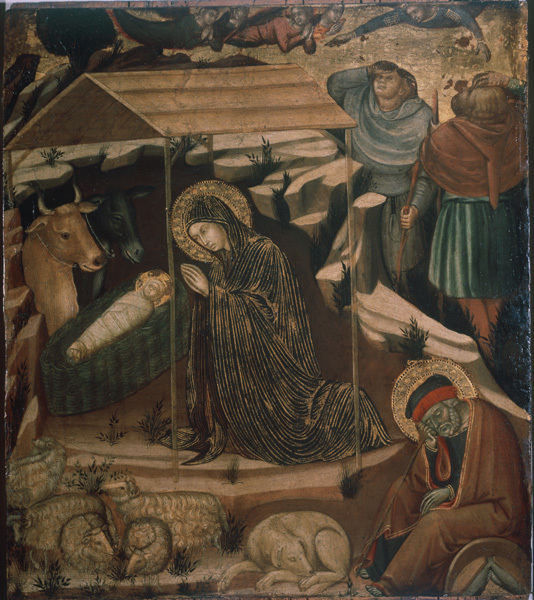 In The Adoration of the Child, c. 1380, by Barnaba da Modena, something of the preternatural stillness that imbued medieval paintings with their sacred aura continues to distinguish the haloed figures of the Virgin Mary, her husband, Joseph, and their infant son, Jesus. Behind the rocky wall that encloses the holy family, however, events are in flux. Craning their necks and shielding their eyes from the dazzling golden light of heaven, two shepherds peer up into the sky as an angel swoops down—arms flung wide—to announce the good news of Christ’s birth. Paintings presented sacred incidents with an immediacy that the written and spoken word could not match. They intensified devotional experience by offering powerful stimulation to the viewer’s memory, emotions, and understanding (see “Painting in the service of religion”). The depiction of religious narrative subjects nonetheless raised a fundamental dilemma. By definition, a narrative describes an event or series of events unfolding over time. How could artists suggest the transient flow of a story in the fixed and circumscribed medium of painting? Developing pictorial means for representing time, movement, and change became one of the central preoccupations of Renaissance art. The Adoration of the Child is an episode following the birth of Christ. According to the Gospel of Matthew, a brilliant star revealed the Messiah’s birth to a group of magi (wise men or astrologers). Eager to pay homage to the child, they journeyed from the East to Jerusalem, where they worried the ruler, Herod, with their news of the birth of a new king of the Jews. As the Magi approached Bethlehem, the star led them to the manger in which they found Jesus. They presented the child with gifts of gold, frankincense, and myrrh.